We hope you enjoy browsing our entire selection of Noro Patterns! Gauntlet-length cuffs, a pretty shell stitch pattern punctuated with sewn-on beads, and a delicate picot edging make for hands-down the most elegant way to keep your wrists warm. 7.5 (8.5)in diameter at ribbing x 7.5 (7.5)in long/19 (21.5) cm x 19 (19)cm. Originally featured in Noro Knitting Magazine, Fall/Winter 2017, Issue 11. Design by Mary Jane Hall. Size F-5/3.75mm crochet hook, 60 6mm beads in light green, beading needle. Short-row shaping lends this crocheted scarf subtle shifts in color. A muted colorway of Silk Garden adds to the mystery. Originally featured in "Crochet Noro: 30 Dazzling Designs". Design by Wilma Peers. 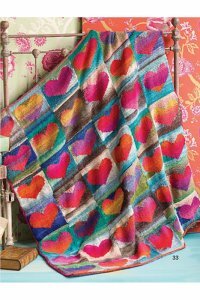 Franz's block blanket features intarsia hearts knit in the passionate pink, scarlet and purple hues of Kureyon colorway #102. Worked in earthy colorway #343 and cerulean colorway #344, the backgrounds hint at a sand-and-sky landscape. One-row garter-stitch borders are picked up and knit along each edge after the blocks have been seamed. Finished Measurements:51 x 56"/129.5 x 142cm. Originally featured in Noro Knitting Magazine, Fall/Winter 2014, Issue 5. Design by Bonnie Franz.